Most of my posts on this blog lately are for things from The Baking Bible bake-through, but once a month, I’m also baking from The Bread Bible. I’ve said it before, and I’ll probably continue to say it every time I post about yeast-based breads: I love baking bread. It’s so forgiving. Even though I have no serious trouble with complicated multi-step recipes where you have to be involved for every single step of the recipe, and if you look away at the wrong second, it’s ruined (think caramel), I love that with bread, you do some stuff, then you let it sit for a while, then you do more stuff, then you let it sit again, etc. That means you have to plan ahead a little bit, but it means you can fit lots of other stuff into a baking day. 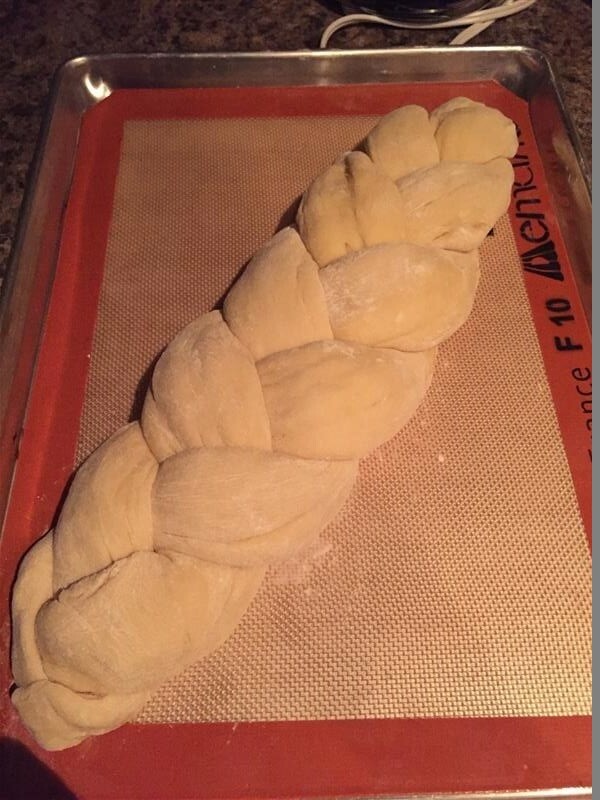 Rose says she’s developed a better recipe for Challah, which is available here, but I just used the one from the bread bible. 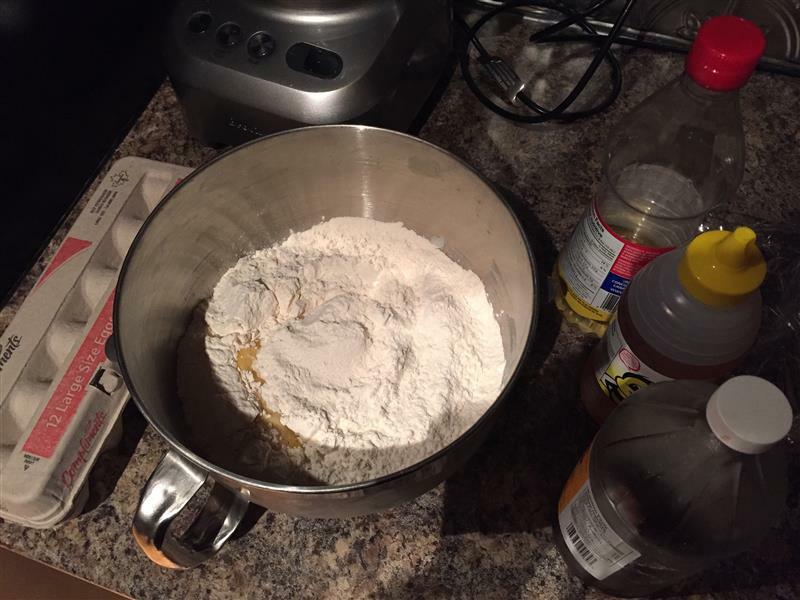 Here’s the first step – mix up most of the liquid ingredients with some flour, then dust that with most of the dry ingredients. Let that sit and ferment for a while. Then, basically, mix it up. Let that sit for another while. After it’s done, stretch it out into 3 or 4 long logs, and braid it. I was lazy and went with 3. I’m not sure I know how to do a 4 strand braid, though after watching the hobbit over the last few weeks, I’m really tempted to try some interesting braids. Those elves have some seriously pretty hair. Anyway, back to baking. This gets brushed with an egg glaze, and put into the oven. Eventually, I covered it with aluminum foil to prevent over-browning, but that didn’t help the over-browning on the bottom. It looks lovely, but I have to admit that I didn’t let it proof quite long enough before putting it in the oven – it would have had a more consistent colour if I’d let it proof long enough to prevent a bit of the oven spring. Oh well! I brought most of the loaf in to work and shared with my Thursday lunch boys. I also brought some grape jelly and apple butter for it, which seemed like it was a bigger hit than the bread. 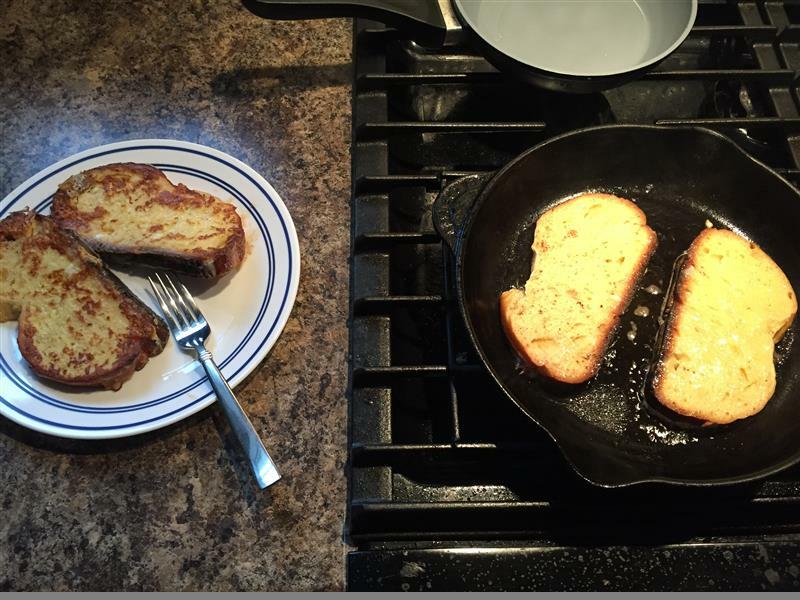 Some of this even made its way into grilled cheese sandwiches – went really nicely with Swiss cheese! At some point, I might try the blog’s version of this one, but I really had no complaints about this recipe! 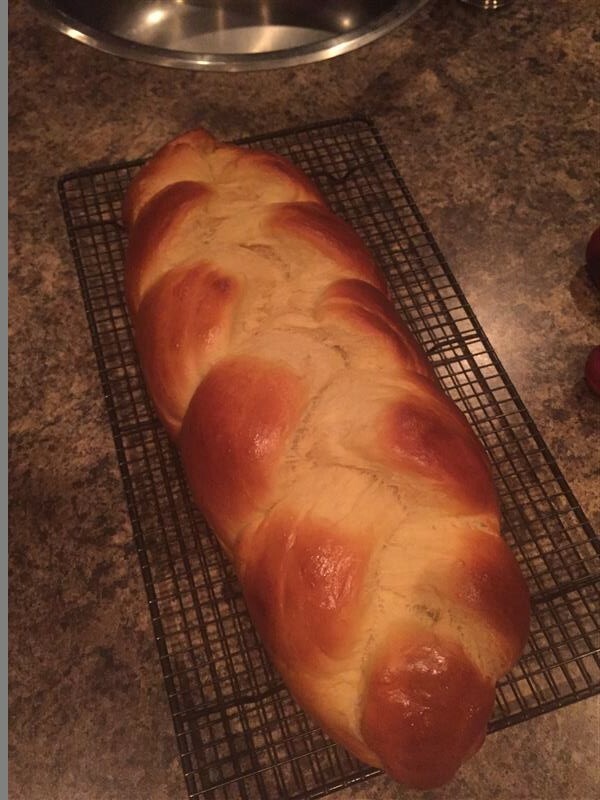 Posted on December 17, 2015 by KristinaPosted in The Bread BibleTagged challah.